This apartment is set at the top of Easter Rd in Edinburgh. 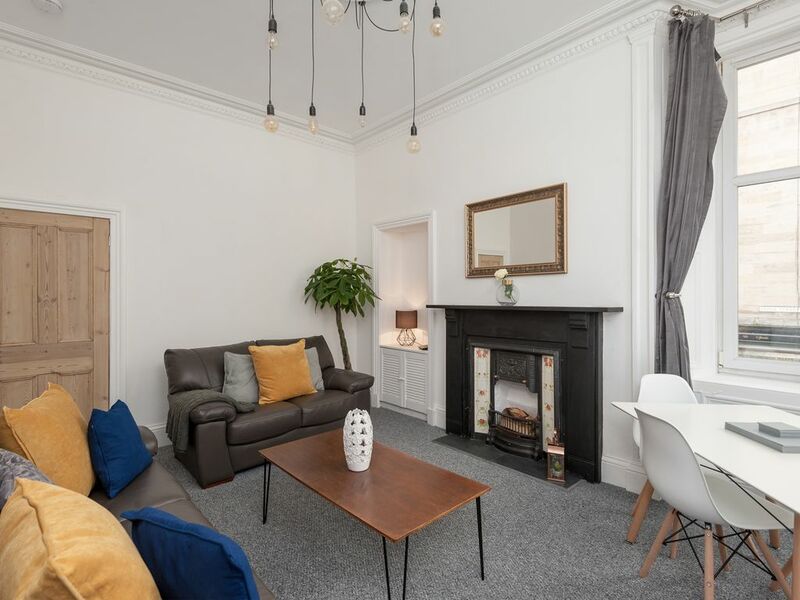 This means you are within walking distance of Princes St, the Scottish Parliament, Holyrood Palace and the Royal Mile which extends uphill with a mile of superb small shops and cafes to the Castle. If you are not wanting to walk, there is a fantastic bus service which allows easy access every few minutes to all these sites and much more! Outside there is a limited amount of free parking and lots of pay and display spaces available. This apartment itself is on the 1st floor of a traditional Victorian tenement. Recently fully renovated, the apartment consists of 2 double bedrooms and a large bright sitting room with bay windows. Each bedroom has high ceilings and traditional Victorian features such as ornate coving and centre pendants with one containing a Victorian fireplace. For your comfort each has a double bed, storage for clothes and smart TV facilities which give access to the usual smart features as well as Netflix. The kitchen is fully fitted and contains a washing machine and dishwasher as well as the same smart TV features of every other room. The bathroom has the same high ceiling and features of every other room and is fully tiled with both bath and shower available. The sitting room is large and bright with the most ornate coving of the apartment. It also has a Victorian fireplace and mantle as well as the bay window with views down Easter Rd. It is fitted with a brand new two piece leather suite with a double sofa bed available. It also has the smart TV features. Free WIFI is included and the apartment also has gas central heating for your comfort with traditional cast iron radiators in each room ensuring that you are as comfortable in this fantastic apartment as possible. Limited free parking and pay and display. Smart Feature and Netflix throughout. They didn't offer paper towels. We would also have appreciated more cloth hand towels as well. Thank you for taking the time to review our apartment. I’m sorry that there was an issue with towels. You never made us aware until now. For your 3 day stay you were provided with 6 hand towels, 6 bath towels and 4 paper towel rolls for the bathroom. However, if you had got in touch we would have done our best to get whatever you needed to you. Thanks again for taking the time to review our apartment. Very clean flat about 20 min walk from the Holyrood Palace and one end of the Royal Mile. The only downside of the property is the noise level in the building. There was loud shouting and door slamming on some nights. Thank you for reviewing our apartment! We are also very close to Princes St and the train station and are surrounded by great cafes and restaurants. I am sorry about any noise within the building. This has never happened before or since your stay and must have been an isolated incident. The apartment was contemporary and had everything you needed. It was a great place. Barry was very responsive. Would recommend this place to my friends. Thank you Barry. The apartment is situated just outside of what I would call the city centre, but it only takes 15 -20 minutes to walk in. Along the way you get some great views. It’s very close to Holyrood Palace. There are some small grocery shops, restaurants and other shops across the road as well as a couple of bakeries. A 10 minute walk takes you to a much bigger supermarket and more restaurants. The decor and amenities are modern and very nice, the only down side is the flight of steps up to apartment are not very attractive, but that’s nothing to worry about. As Australians, we were wondering why no face washers had been supplied, but they don’t seem to have them in Scotland - bring one with you. Other wise 5 stars! Good location and transport links. Very clean and well furnished. Kitchen ideal for self catering well equipped. Another towel each would have been welcome but would come back again without hesitation. There are two towels provided for each guest. Please get in touch if you need more than that. We’re here to help! Apartment was lovely. We were two couples on a 3 night stay. Very clean. Owners communication was superb and quick replies. Barry was very helpful. 15 minute walk from major sites which was fine for us. CoOp right opposite was very handy.